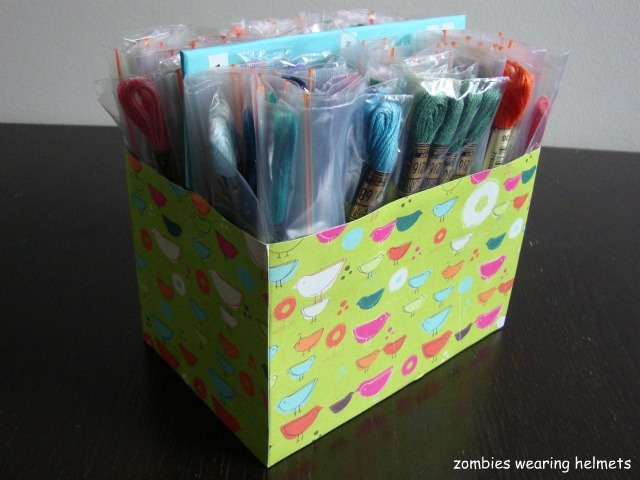 There are lots of awesome ways to organize embroidery floss, and I've tried most of them. None really worked for me though, and the biggest problem was having to choose between sorting them by colour numbers or by colour families. I wanted to have my skeins in numerical order to quickly and easily find colours needed for a pattern, and I wanted to be able to see all of the colours together without too much hassle. Basically, I wanted to have my cake and eat it too. I briefly considered leaving them lined up on the dining table before I realized that we'd have nowhere to play board games. Or eat. 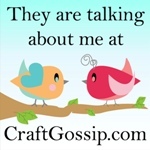 This is why I need a craft room. Step 1: Organize your stash. I sorted my floss by number, putting each one into a snack bag. I love tedious tasks so this was fun for me. (And no, I'm not being sarcastic.) 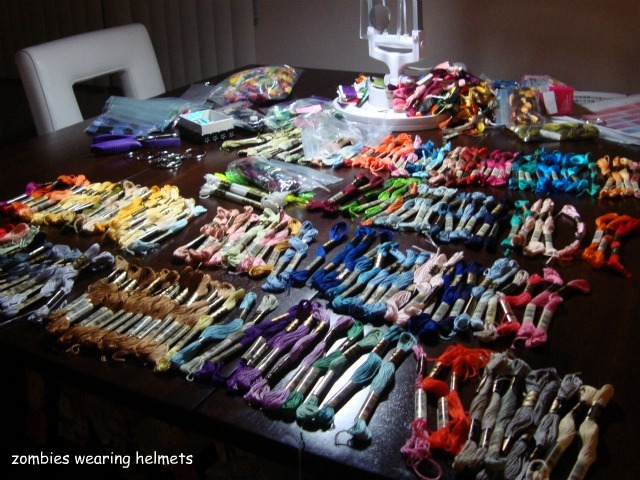 In this picture you can see the key rings from my last method of storage which organized the floss by colour families. Also, in the top right hand corner you can see the DMC Colour Charts and conversion tables. 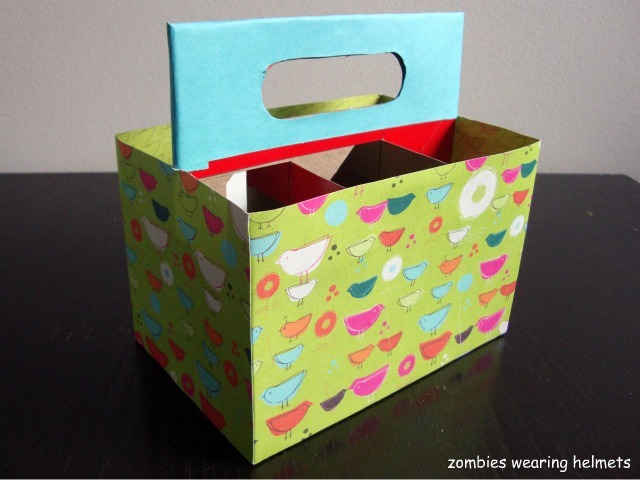 Those are super useful to have, so I put them in my pattern binder. 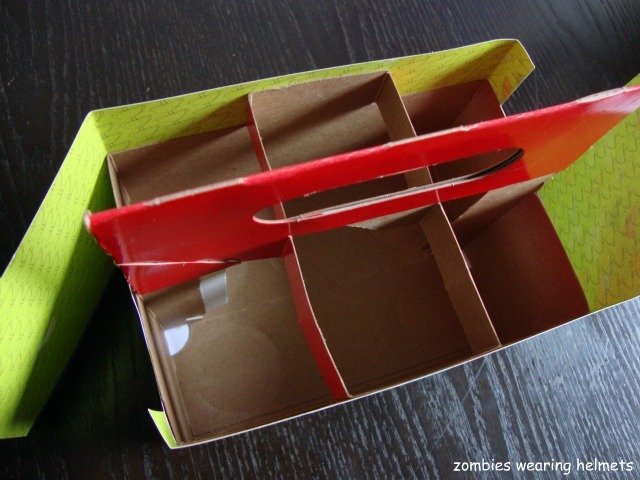 Step 2: Reinforce the box. 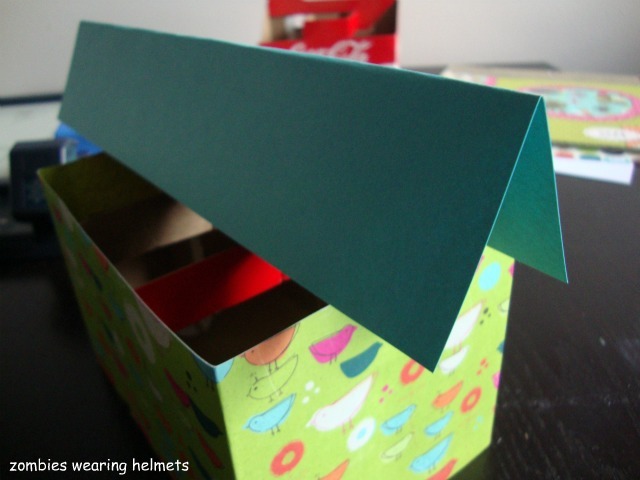 Glue card stock to the ends and bottom. 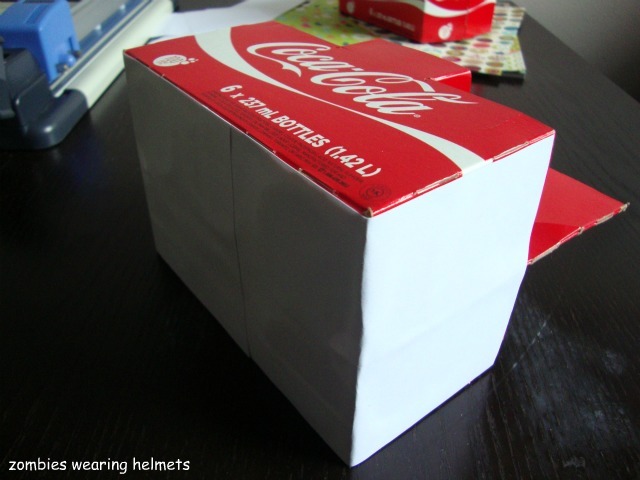 I used a Coke bottle box because it had those dandy partitions and a carrying handle. It's also the perfect height! Step 4: Cover the handle. I folded the paper over the top, eyeballed where the hole should be and cut it out, then trimmed the sides and glued it down. And it's done! Ta da! Now you get to fill it up with your bags of flossy goodness! This one box holds all of my Anchor brand floss, which I separated by groups of numbers: 000s, 100s, 200s, and on through the 1000s. (I have way more DMC floss than Anchor. I'll probably need three or four boxes for them.). I made sure to keep the ends with the number label at the top so it can be easily located. Then I labelled the slots by putting number stickers at the top of the handle: 0 is for numbers below 100, 1 is for the 100s, 2 is for the 200s, and so on. Some groups were bigger then others so I combined those into one slot. You can see in the picture how one slot is labelled with both 0 and 3. Another has 8, 9 and 10. This is great compromise between sorting by numbers or colours. If I need number 404, I just have a poke through the 400s. It's super easy to take them all out if need be, find the one I want, and then pop the rest back in. No worries about keeping them in an exact numerical order. If I need a dark brown, I just have to look! The colors are all visible and it's easy to pull out any likely suspects to get a closer look. And again, just pop them back into the right slot. And, you can forget all about the numbers and just separate them by colours if that's how you prefer to sort your floss. I'd love to see how you organize your embroidery floss! Everybody has a different system that suits their needs, and pictures of floss and other supplies are always fun to look at. And if you were searching for a new system and are inspired by mine, I'd love to see your version! Yes! I love it! And it is so timely too, because I just saw another idea on Pinterest (clothes pins, wound up) and I thought I bet that person doesn't embroider very much, because I find even with the cards, it winds the thread to small and makes it tend to twist and tangle more easily when you sew. That's it Leah! You and I think way too much alike! I just posted about re-organizing my embroidery floss and then I saw this! Weird huh? Oh this is fabulous! I have switched from those silly little cards because they were such a hassle AND crimped my thread and just recently started using snack sized baggies which I love but they are all just tossed in a box and it's a nightmare to find what I want! I had considered putting them all on rings in number order, but that makes it much harder than your method! I love it! Sounds like you have the same problems I did! Hopefully this works for you too. You could even sort them by colour alone if you prefer. Okay, so I've been trying to figure out a new way to organize for months now. 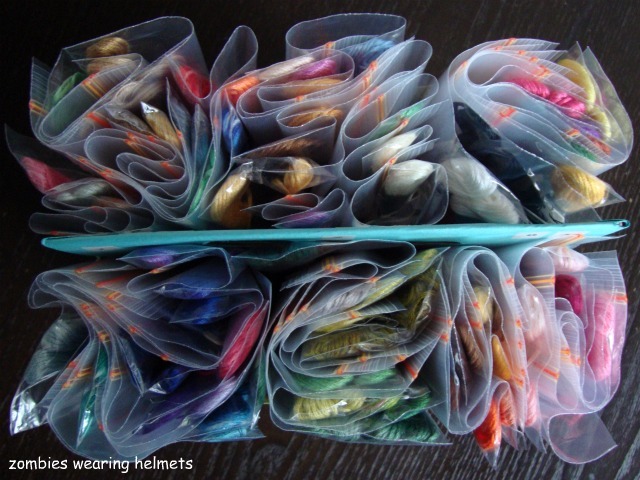 I want to use the baggies because they're just so much easier than the silly little bobbins. But storing them when it's not a project? Ugh. This works! Yeah! Thanks. Your so welcome of course! 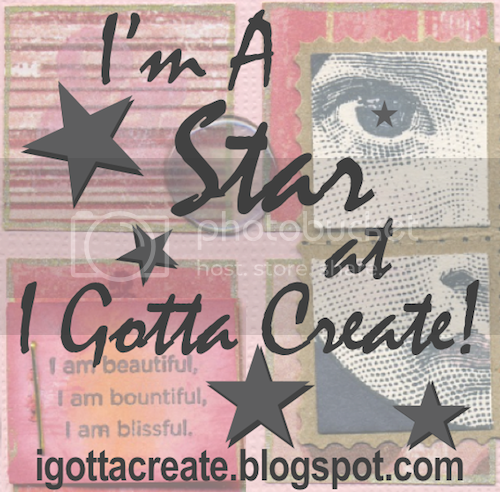 I'm so glad you were inspired. You just saved my day! This is how I'm going to to my newly acquired thread. 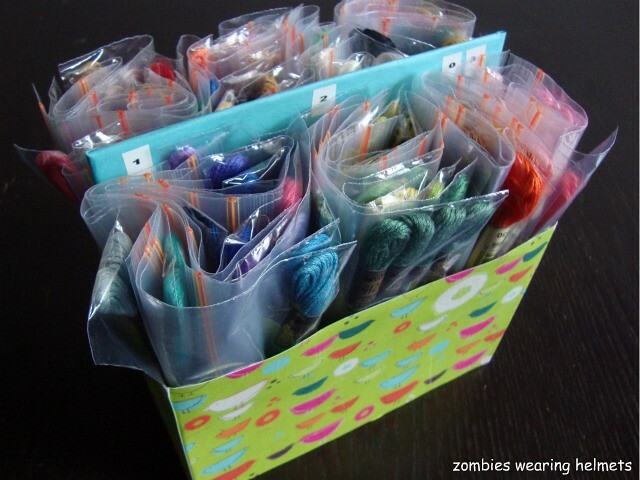 A friend of the family died and I acquired over 1000+ skeins of thread for my projects and I needed a way to organized. This is it! Thank you! Second of all, thank you so much!